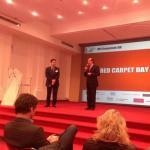 On 15th October, more than a hundred and eighty people attended the second annual edition of Red Carpet Day in Paris, a seminar organised by the UFE GB (l’Union des Français de l’Etranger) to help French entrepreneurs cross the Channel. It’s 9am, at the Tapis Rouge in the 10th arrondissement of Paris. The first entrepreneurs are arriving, the speakers, experts and exhibitors are already there ready to welcome them. Café-croissant in one hand, computer and files in the other, Red Carpet Day gets going. The objective for the day is clear: present the opportunities existing on the other side of the Channel to launch a new company, diversify an existing one, or simply export. They talk business in English and French; the French entrepreneurs keen to enter the UK market speak to those who have already taken that step, or to experts in various areas who can advise them on how best to do it – consultants in taxation, British law specialists, insurance and real estate professionals...They are all there to help. On the menu: conferences, round tables, speed dating… all they need to understand the UK market and how to avoid the pitfalls in order to succeed. The speakers make them aware of the advantages in terms of taxes, employer’s contributions, access to funding. The UK appears to be an unavoidable destination for French companies. David Cameron, The UK Prime Minister and Boris Johnson, the London Mayor, are both famous for flirting unequivocally with French companies in a bid to attract them to the UK. Of course, with nearly 550 000 businesses being created each year, France is a country of entrepreneurs, and initiatives to attract them are on the increase. On 15 October, a mile from where the Red Carpet Day was being held, the Mash-Up competition was taking place, an event created to give start-ups the key to a successful internationalisation. Ironically, these two offensives come from France! The entrepreneurial dynamic of France is without doubt a good card to play to get France out of its present critical economic situation. Martine Aubry understands it, if we believe what she said last weekend: the former first secretary of the Socialist Party declared that the distribution of assistance for businesses had to be better targeted, to support more particularly the ones which are more exposed to strong competition and the ones which invest and hire. In actual fact, it is not just abroad that the red carpet is being rolled out for French entrepreneurs.